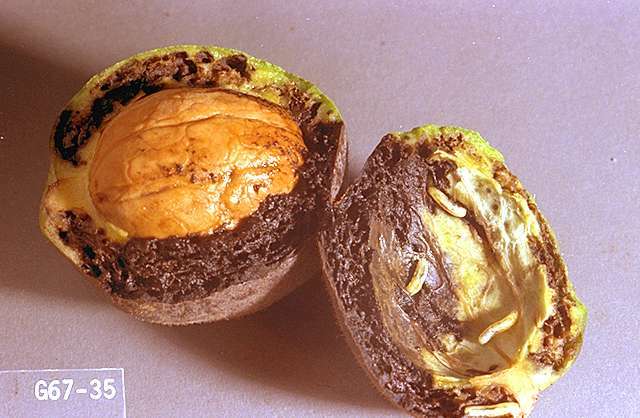 Pest description and crop damage The walnut husk fly is the most important pest of walnuts in the Pacific Northwest. This pest is native to the south-central United States, but is now widespread throughout western North America. The walnut husk fly is about the size of a housefly. 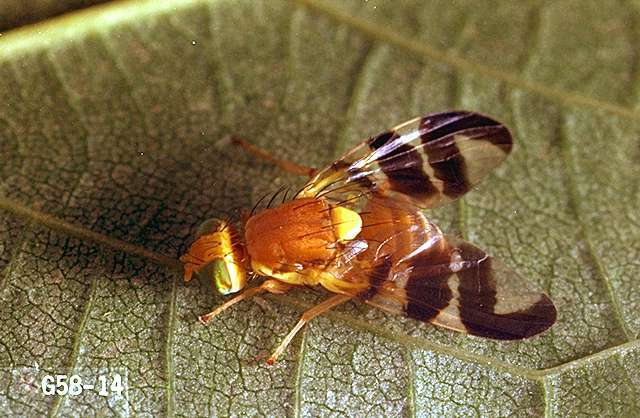 It has a yellow spot just below the areas where the wings are attached and the wings have three prominent dark bands, one of which extends around the wing to form a V-shape. The larvae/maggots are white and up to 0.19 inch long. 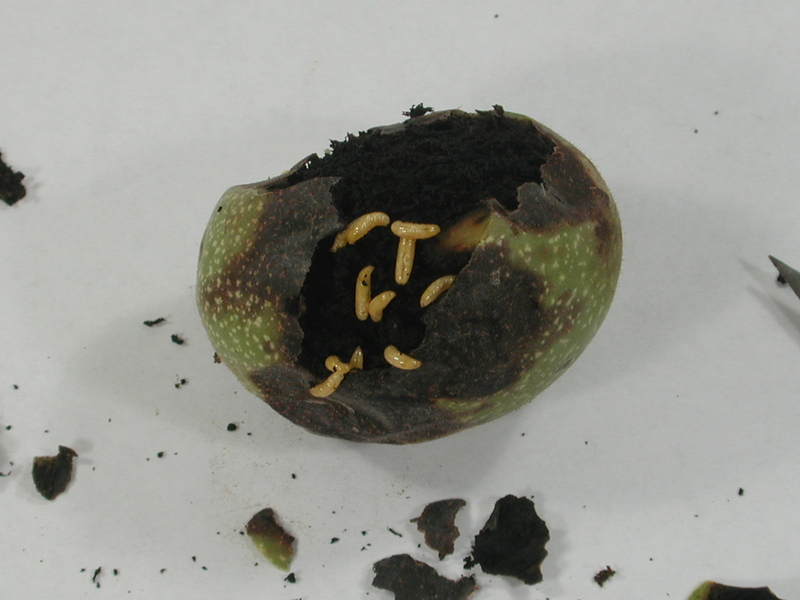 Larvae feed in groups within the husk, which stains the nutshell, and lowers nut quality. Dark, soft blotches on maturing husks are symptoms of infestation. 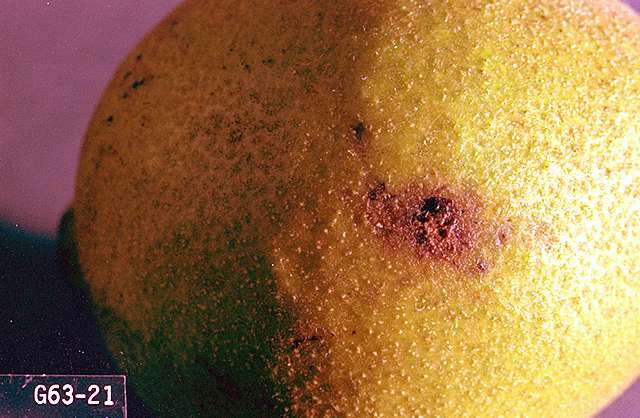 Blotches that are hard and dry are caused by walnut blight (a disease) and should not be confused with husk fly damage. In California, the Franquette and Mayette varieties and seedlings of Manregian and Carpathian are considered very susceptible to husk fly damage. The damage is largely cosmetic staining on the nutshell and is primarily a concern for in-shell walnuts. Because eggs and maggots are protected in the husk, the adult stage is typically the target for management. Biology and life history Walnut husk flies overwinter as pupae in the soil and adults emerge in early- to mid- summer. Female flies deposit eggs in groups of about 15 below the surface of the husk. The egg deposits show up as small black areas on the husk. Eggs hatch into white maggots within 5 days. The maggots feed inside the husk, enlarging the black area, which remains soft, unsunken, and smooth. The outer skin of the husk usually remains intact, but its fleshy parts decay and stain the nutshell. After feeding on the husk for 3 to 5 weeks, mature maggots drop to the ground and burrow several inches into the soil to pupate. Most emerge as adults the following summer, but some remain in the soil for 2 or more years. Native parasites and predators do not effectively control this pest. Sanitation is important. Remove nuts from the orchard floor to help prevent the fly from successfully pupating in the soil. Flail, mow or rake nuts that drop early and after harvest. Remove abandoned black walnut or English walnut trees. Ground barriers may help home orchardists. Plastic tarps or heavy mulch layers in place during nut drop can prevent or inhibit larvae from entering the soil to pupate. Some pupae can remain in soil for more than one season so persistent sanitation is key to long term management. Home orchardists may choose not to control the walnut husk fly and tolerate staining of shells. Loosen affected husks by packing nuts with a moist material for several days before hulling. Timely application of sprays is important in order to prevent adult flies from laying eggs (see sampling recommendations, above). Baits mixed with insecticides can reduce the need for good spray coverage for homeowners that don't have capacity to spray the canopy. acetamiprid-Do not apply until after trees have flowered or when bees are actively foraging. Do not make more than one application a year. PHI 7 days. Timely application of sprays is important (see sampling recommendations, above). Efficacy of insecticides targeting adult flies can be enhanced by tank mixing commercial fruit fly baits, or use GF-120, a bait/insecticide formulation. Incorporating baits can also reduce the need for thorough spray coverage as flies will be attracted to droplets for feeding. acetamiprid (Assail 30SG) at 0.12 to 0.15 lb ai/a. Add a recommended rate of husk fly bait. No more than 4 applications and a maximum of 0.72 lb ai/a per growing season. Retreatment interval 14 days. PHI 14 days. alpha-cypermethrin (Fastac EC) at 0.02 to 0.025 lb ai/a. Retreatment interval 7 days. Maximum 0.075 lb ai/a. PHI 7 days. beta-cyfluthrin (Baythriod XL) at 0.0.19 to 0.022 lb ai/a. Maximum of 0.22 lb ai/a per season. PHI 14 days. bifenthrin (Brigade WSB) at 0.1 to 0.2 lb ai/a. PHI 7 days. REI 12 hr. bifentrin+abamectin B1 (Athena) at 13.5 to 20 fl oz/a. Retreatment interval 21 days. Maximum of 2 applications per season. PHI 21 days. chlorantraniliprole/lambda-cyhalothrin (Voliam Xpress) at 6 to 12.5 fl oz/a (suppression only). PHI 14 days. REI 24 hr. Minimum of 7 days between applications. Do not exceed a total of 31.0 fl oz of Voliam Xpress or 0.24 lb ai of lambda-cyhalothrin containing products or 0.2 lb ai of chlorantraniliprole containing foliar products per acre per growing season. chlorpyrifos-Generic labels for chlorpyrifos are also available. Lorsban 4E at 3 to 4 pints/a. PHI 14 days. REI 1 day. Do not exceed one dormant-stage application or two foliar spray applications on walnuts per season. Do not graze orchard floors. Lorsban 75WG at 2.67 lb/a. PHI 14 days. REI 1 day. Do not exceed two applications on walnuts per season. Do not graze orchard floors. Extremely toxic to fish. Toxic to birds and wildlife. chlorpyrifos/gamma-cyhalothrin (Cobalt) at 26 to 57 fl oz/a. PHI 14 days. Do not make more than 2 applications per season of Cobalt or other product containing chlorpyrifos for walnuts. clothianidin (Belay) at 0.05 to 0.1 lb ai/a. Maximum 0.2 lb ai/a per season. Retreatment 10 days. PHI 21 days. cyfluthrin (Tombstone) at 0.038 to 0.044 lb ai/a. Maximum 0.044 lb ai/a per season. PHI 14 days. deltamethrin (Delta Gold) at 0.02 lb ai/a. Maximum 0.165 lb ai/a. Retreatment interval 7 days. PHI 21 days. esfenvalerate (Asana XL) at 10 to 16 fl oz/a. PHI 21 days. REI 12 hr. Do not exceed 0.2 lb ai/a per season. Do not feed or graze livestock on treated orchard floors. Extremely toxic to fish and aquatic habitat. lambda-cyhalothrin (Warrior II) at 1.28 to 2.56 fl oz/a. PHI 14 days. REI 24 hr. Do not exceed 0.16 lb ai/a per season or 0.12 lb ai post bloom. malathion (Malathion 57% EC) at 0.4 to 0.6 oz/a. PHI 7 days. REI 12 hr. Ambush 25W at 16 to 24 oz/a. PHI 1 day. REI 12 hr. Do not graze livestock in treated orchards. Extremely toxic to fish and aquatic habitat. Ambush 2E at 16 to 24 oz/a. PHI 1 day. REI 12 hr. Do not graze livestock in treated orchards. Extremely toxic to fish and aquatic habitat. Pounce 3.2 EC at 8 to 16 oz/a. PHI 1 day. REI 12 hr. Do not graze livestock in treated orchards. Extremely toxic to fish and aquatic habitat. phosmet (Imidan 70W) at 4.33 to 8.5 lb product/a. PHI 28 days. REI 7 days. Do not exceed five applications per season. Highly toxic to bees. Extremely toxic to fish. Avoid spray drift and runoff to surface waters. spinetoram (Delegate WG) at 3 to 7 oz/a. PHI 14 days. Apply no less than one week apart, with a maximum 4 applications per season. spinosad (Entrust SC) at 4 to 10 oz/a. PHI 14 days. REI 4 hr. OMRI-listed for organic use. spinosad (Success) at 4 to 8 fl oz/a. PHI 14 days. REI 4 hr. Do not exceed 29 oz/a per year or apply fewer than 14 days apart. spinosad bait (GF-120 NF) at 20 fl oz/a. PHI 0 days. REI 4 hr. Apply every 7 days. Can be applied from the air or with an all-terrain vehicle (ATV). Apply 0.8 to 1 gal/a with a D3 nozzle attached to an ATV. Apply at 10 to 12 mph, using the listed rate and nozzle size. zeta-cypermethrin (Mustang, Mustang Max, Mustang Maxx) at 0.02 to 0.025 lb ai/a. Maximum of 0.125 lb ai/a per season. PHI 21 days. 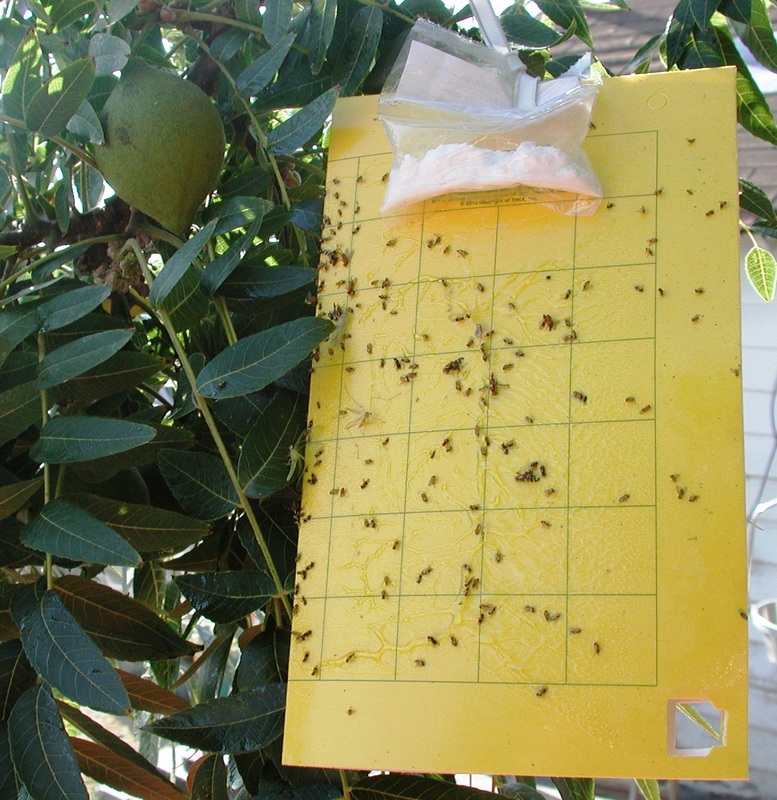 Note: For more information on the husk fly and trapping methods, see OSU Extension publication EM 8907, Growing Walnuts in Oregon (https://catalog.extension.oregonstate.edu), and WSU Extension publication FS039E, The Walnut Husk Fly (https://pubs.wsu.edu/).